The constellation Cassiopeia. Roll mouse over to see labels. Cassiopeia is one of the most recognisable of the constellations, a distinctive 'W' shape in the far northern sky. It is highest in the sky at midnight in the months around September. The plane of the Milky Way runs through the middle of the 'W' asterism, making it a particularly rich area of the sky to view through binoculars. It contains more than twenty open clusters exceeding tenth magnitude, and a similar number of fifth magnitude stars. In classical mythology, Cassiopeia was queen of Ethiopia, wife of Cepheus and mother of Andromeda. 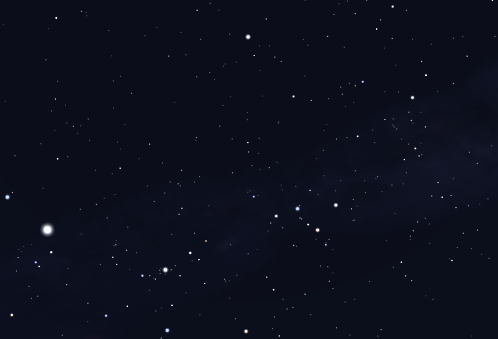 Cassiopeia contains the following Messier objects: M52, M103. Cassiopeia contains the following Caldwell objects: C8, C10, C11, C13, C17, C18. 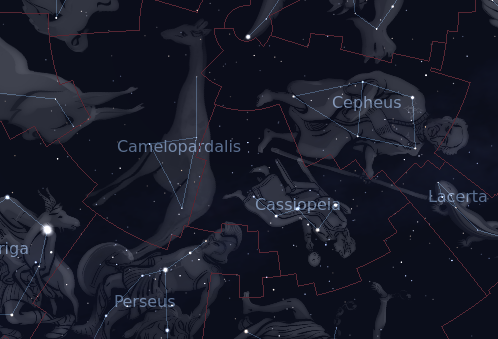 The following constellations neighbor Cassiopeia: Andromeda, Camelopardalis, Cepheus, Lacerta, Perseus.